XI'AN, China, Jan. 16, 2019 /PRNewswire/ -- A premier event in the world of fashion and the garment industry, the third Belt and Road International Fashion Week (BRI Fashion Week) has wrapped up in Xi'an after welcoming leading designers, artists and industry professionals from more than 20 countries. 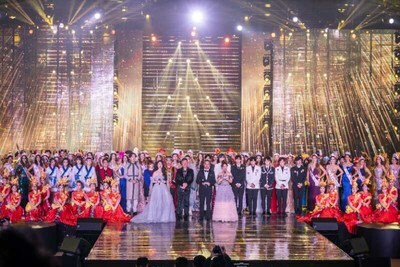 The five-day event has shone a spotlight on the cultural and artistic heritage of Xi'an, and highlighted its important position within China's Belt and Road initiative (BRI), China's globe-spanning infrastructure and cultural development project that retraces the mythical Silk Road trade routes, which originated from this ancient city. BRI Fashion Week's series of fashion shows featured traditional, contemporary and modern styles, while the "Global Development in Fashion" forum served as a platform for industry leaders to discuss ways to strengthen the industry. With a focus on integrated technology, cutting-edge fashion, culture and economic development, the forum solidified Xi'an as a center of the global fashion industry and facilitated discussions on how the industry can continue to grow not only locally but around the world. "Xi'an is the perfect location to hold BRI Fashion Week, and we are thrilled with the event's success," said Wang Haotian, Chairman of the BRI Fashion Week Organizing Committee. "The city's long history with profound cultural elements inspires designers and artists in the fields of fashion, arts, architecture and more. At the same time, it is moving forward, modernizing through the leveraging of cutting-edge technology and urban planning. It is both an ancient city that stands as a real connection to the ancient Silk Road and a key linchpin in today's globe-spanning BRI. There is no better place to gather together professionals in the areas of art, fashion and textiles to talk about how our industries, through international cooperation, can fulfill the needs of people who live across the developing world." The week's events gathered together well-known designers such as Wang Xiaoxia, President of L'OFFICIEL China; Mao Junjie, APAC Managing Director of MARC JACOBS; Lu Hao; Tony Brown; Arnault Garcia; Ma Qingyun and Laurence Xu. Distinguished guests at BRI Fashion Week included Phinij Jarusombat, former Deputy Prime Minister of Thailand and Chairman of the Thai-Chinese Culture and Economy Association; Du Yue, UNESCO's Deputy Director Division for Cooperation, Intersectoral follow-up, and Partnership at the Africa Department; and Long Yuxiang, Executive Chairman of the China International Cultural Communication Centre (CICCC), along with ambassadors and representatives from countries such as the U.S., United Kingdom, Nigeria, and Tunisia. Belt and Road International Fashion Week is co-hosted by the China International Cultural Communication Centre and Xi'an Municipal Government. With a focus on fashion culture and industry along the Belt and Road Initiative, the event aims to build an exchange platform to further promote fashion development in China and around the world.